You’ll notice a common theme here. 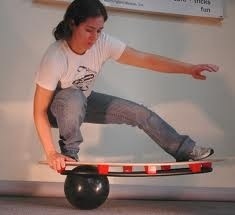 All of the tools (toys) listed here are designed to help you improve balance and proprioception. These skills carry over in spades to all your athletic persuits: running, cycling, skiing, surfing, climbing, kiteboarding, football, basketball, tennis, and possibly even bowling. Rocker boards are a great tool to teach you how to stabilize your foot and ankle. Hard unstable surfaces provide an optimal training environment to improve you. You should look for a board that only rocks in one direction (thus the name rocker board). Many folks also make boards that wobble and spin in all directions (called wobble boards). Both have their place, but when it comes to training the foot and lower leg, I’m a big fan of the former. These are sold in many places. If you are looking for suggestions, I typically direct people over to sportssmith.net because they have the cheapest one I’ve found: $29.99. #2: Surfing in your living room – meet the Si-Board. So you’ve mastered basic balance skills, and are looking to quite possibly have as much fun as possible while under your roof? Look no further than the Si-Board. 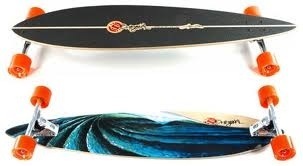 Sure the Indo Board is cool, but this thing is in a class by itself. I have one and absolutely love it. Its so much fun! Its not one of those things you’ll say “oh I have to make time to work on my balance……” Its so engaging that you may find yourself taking time away from other things! Your feet and hip stabilizers will get a workout like nothing else. They are pretty $$$$. I bought the DIY creator kit for cheap, and in 45 min was “surfing” in my living room. In my mind, if you are an athlete, you should have one of these. Period. #3: Surfing down the pavement –> Longboard. Presents are all about fun right? Buying a long board was one of the best decisions I made. Its not like hucking off the loading docks like we all did when we were 12. This is all about the flow. It’s great to carve slalom turns down the hill – almost as much fun as skiing or snowboarding. And once you learn to “pump it” you can fly. I can roll miles down the road without pushing at all. I guess some people might say its a great workout, but its so much fun I’d do it even if balance skills didn’t translate into other sports. What board to get? wow – there are hundreds of options out there. Personally, I’ve got a Original Pintail 40. I bought it because it has springs instead of bushings. This makes it easy to rail turns at low speed and a bit tougher to control at high speeds, but lets’ face it: Most of us aren’t looking to hit 50 mph down a mountain while slamming a RedBull. Only warning I’d offer is this: you may find yourself longboarding more and doing your typical sport a bit less! #4: a book? 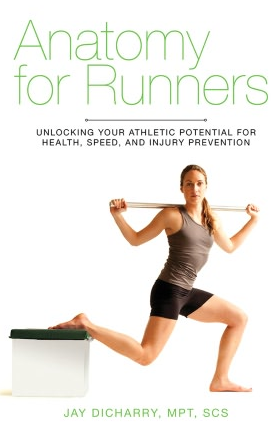 Maybe a book called Anatomy for Runners! Its by far the cheapest thing on this list, and quite possibly the most valuable. I’ve spent many years of my life teaching. I’ve taught at UVA and continue to teach around the US. You’ll be surprised what people are capable of when you give them the knowledge to succeed. That was the goal behind my book. Its a way to give you information to help you hit your goals this season and beyond. 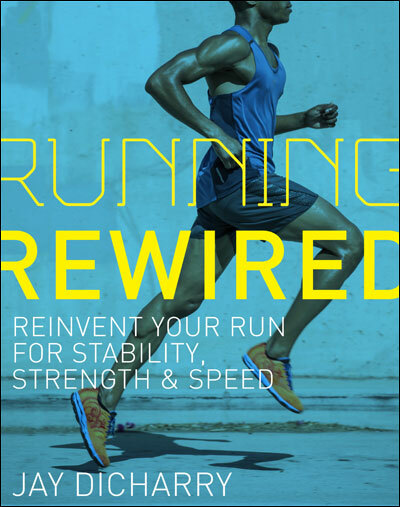 Sure its slanted towards runners, but about 80% of the information in there applies to other endurance and strength and power sports as well. If you are looking at the equipment above and thinking “that’s a bit high level for me- no way”……let’s put something out there. Blowing past your comfort zone is the only way you’ll ever make jumps to the next level in your performance. And yes, I’ve put “old folks” on these with tons of success. Sure you should be careful when you are learning, but I will caution you that liberal use of #2 and 3 above just might result in fun! Disclaimer for the people who think I’m funding my retirement with these recommendations. I personally bought the Si-board starter kit and my Original Longboard (in fact I bought a second one too! 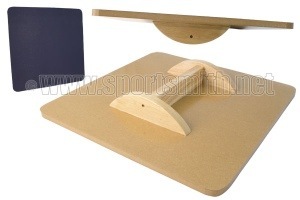 ), and my clinic purchased the rocker board form Sports Smith. These folks have no idea that I am writing this, and I’m getting absolutely nothing in return. Well, with the legal mumbo jumbo out of the way, Happy Shopping, and Happy Holidaze!!! And if you’d like to re-live a little Christmas story from last year, check out how Climate change is impacting reindeer training. This entry was posted in cycling, rehab, running, Uncategorized and tagged Anatomy for Runners, christmas, cycling, Dicharry, endurance, form, gait, gait analysis, injury, medical, rebound physical therapy, rehab, sking, surfing, swimming, UVA SPEED Clinic on December 14, 2012 by an athlete's body. Elysia from Si-Boards here- Thanks for your post! I’m excited to read your next articles. Keep up the good work!